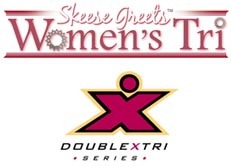 Skeese Greets, Greeting Cards for the Athletically Minded, is pleased to announce, in conjunction with the Double X Tri Series, its title sponsorship of the Skeese Greets Women's Tri. The Skeese Greets Women's Tri convenes on Sunday, August 26, 2007 near Austin, Texas. It is the second triathlon of the Double X Tri Series, a three event women's series during the summer of 2007. The accomplished race directors will make each event unique, safe and beginner friendly. The intimate venue is ideal for participants and family members alike. Nestled in the Texas Hill Country, the three triathlons will offer participants the opportunity to swim in a small, man-made cable lake; bike through scenic tree-lined, rolling hills; and put their running shoes on for a paved road run. Afterwards, they'll be treated to a great post-race party with lots of give-a-ways, burgers, beer, and free massages. They can also relax on the beach as they listen to music and watch cable skiers flip tricks. "The Double X Tri Series was born out of a need in the community," says Stacy Keese, owner of Skeese Greets. "The Danskin Triathlon is the largest triathlon in Texas, but the majority of the 3000 women only participate in that one triathlon each year. We want women to have the opportunity to continue in their active lifestyle beyond that one triathlon." Companies interested in having a free booth and/or donating product to the Skeese Greets Women's Tri or to the entire race series are encouraged to contact Stacy Keese of Skeese Greets at 888.472.5646 or stacy@skeese.com. She can also be contacted for triathlon entry forms. For online entries or for more information on the event series, go to www.doublextri.com.